Neo Cosmo N023 Violet Colour Ring contacts feature a beautiful violet colour as well as pretty dark ring surrounding it and making the eyes bigger. There are 2 lenses in a box. If you're looking for eye vision correction and a pretty looks change, you are in the right place. 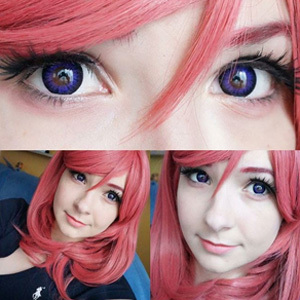 With Neo Cosmo N023 Violet Colour Ring contact lenses you will gain a beautiful violet eyes with an extra outer ring which makes them even bigger and sexier. What's more, your eyesight will feel better too as they come in corrective powers! Is there anything else you might need?